For many, autumn means falling leaves for crunching underfoot or raking into a piles for canon-balling. For us, autumn’s colourful by-products are a full sensory experience. Right now, trees all over the country are exploding in shades of red, orange, and gold. Canada is a beautiful country year round, but the fall leaves bring something special. Whether you’re in the middle of the city, out in the country, or deep in the mountains, trees are celebrating the change in weather and giving us a spectacular show. And we’re giving them a standing ovation! Nicely done, Canada. Nicely, done. Here are 10 stunning places to enjoy autumn – and the fall leaves – in beautiful Canada. 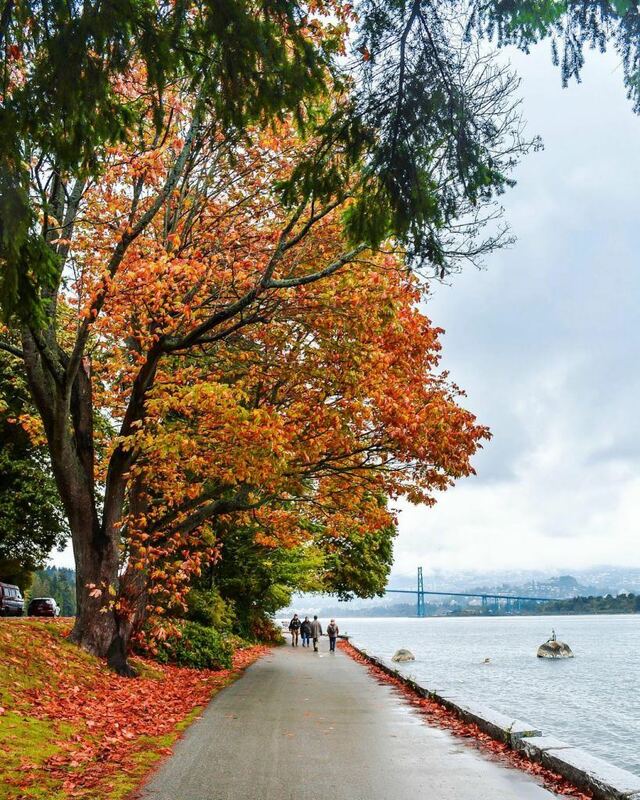 There’s something quintessentially West Coast about wandering around a drizzly Vancouver seawall with a pumpkin-spiced latte in hand, and enjoying the coziness of Stanley Park. Who wouldn’t want to take a fall adventure down this path in Cassidy, B.C.? It’s the perfect blend of colours, transitioning from summer to fall with rustic elegance, and just a hint of mystery. How exciting! You, too, can bundle up in Kelowna and enjoy the crunchiness of leaves, warm sunshine, and a rambling stream before the weather turns colder. 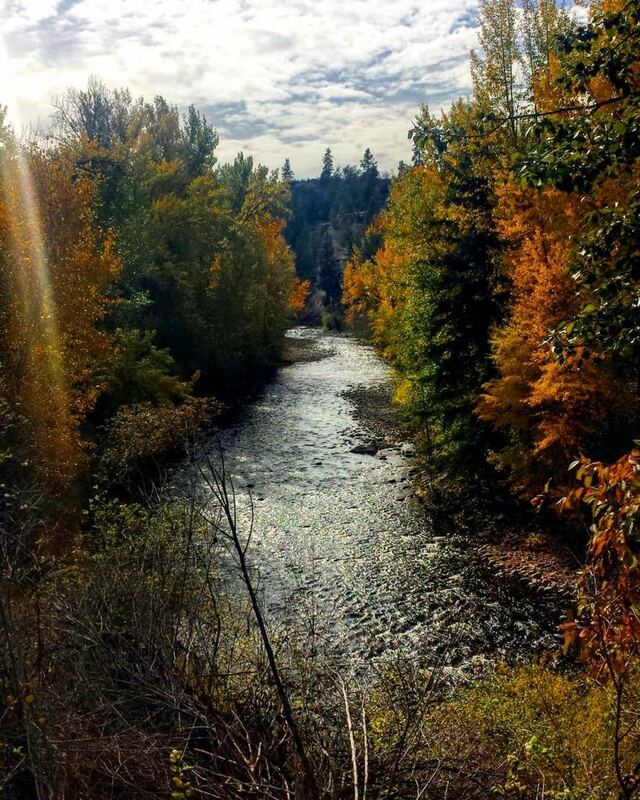 Just pack up the truck and take a quick drive out to Mission Creek Regional Park to explore! If this isn’t the perfect weekend, we don’t know what is. Nothing says fall coziness more than an afternoon in the park with our fur-babies. Who packed the picnic? Even in the middle of the city, Calgarians enjoy the ambiance of fall nature and people watching in Prince’s Island Park. Want to get away from it all? The Rocky Mountains in Alberta are the perfect fall getaway from… everything. Nothing but rugged wilderness out here! Frost is showing up in some parts of Saskatchewan already – like here, in Waskasiu Prince Albert Park. But that doesn’t stop us! The gold in those trees makes us feel like we’re treasure hunting! Now that’s a view! While we love the scenery in Mont Pinacle, it’s the cozy rainbow of fall colours the trees are displaying that warms our hearts. We think we’ll stop and sit a while. Right here. If you bring the hot cocoa, we’ll meet you there. Leaves are a brilliant red in Nova Scotia this time of year. It has us all fired up! But chances are, if you look out your own backdoor, they’re just as colourful. We’re sure lucky to live in such a beautiful place. How are you enjoying our Beautiful Canada this fall? Share your Beautiful Canada and fall leaf inspiration and tag us on Facebook, Twitter, Instagram, Pinterest or YouTube ! With the arrival of spring (finally! ), we know that wedding season is just around the corner. So many details go into planning a wedding: the perfect dress, amazing food, gorgeous flowers, thoughtful invitations, meaningful vows, stunning (yet delicious) cake…the list can seem endless. Luckily, with some of the most stunning scenery on the planet, beautiful wedding photos are one thing we don’t have to worry too much about around here. Here are some incredibly beautiful Canadian wedding photos we found! 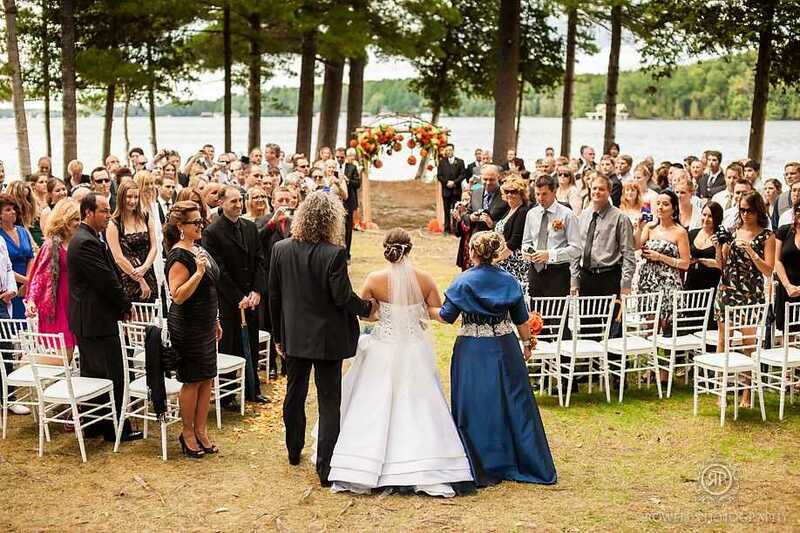 Here’s a gorgeous shot of a quintessential Muskoka Cottage Country wedding. We hope it was at the beginning of the summer, because the guests probably wanted to stay well into September. A moment of quiet beauty was captured in this unexpected wedding photo, shot just outside Calgary. Hats off to this brave BC bride who looks like she’ll do whatever it takes to get a great wedding shot. After celebrating their nuptials in a modern, Western style, this Korean-Canadian couple chose to include a traditional element in their wedding to pay respect to their families and customs, and their photos captured both colourful traditions beautifully. 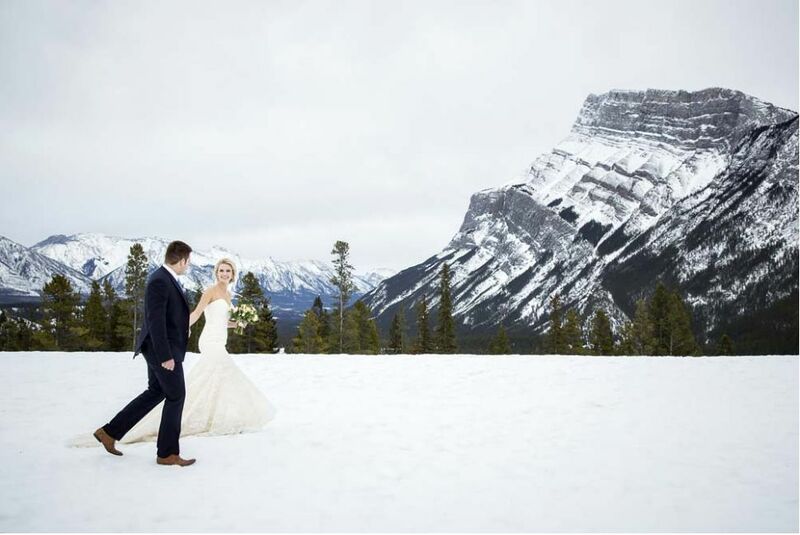 As one of the most beautiful places on earth, Banff is a common locale for weddings, and this gorgeous couple certainly took full advantage of the ready-made scenery for this epic wedding shot. The Fanshawe Conservation Area near London, Ontario is the perfect location for an outdoor wedding, and these beaming brides undoubtedly got a ton of beautiful photos here. Do you have a jaw-dropping Canadian wedding photo you think the world should see? Share it with us in the comments!